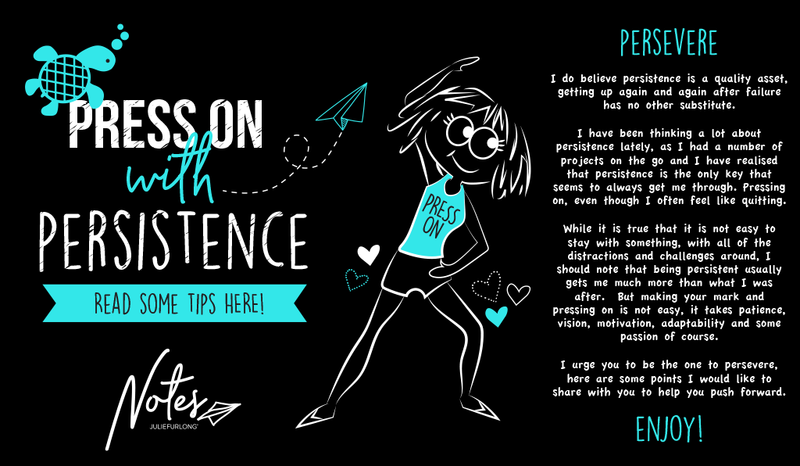 Press On With Persistence | How to be persistent and why is it important? I have always lived by a number of personal mottos. One of them is: “all you need is passion, personality and persistence”, and I have learnt over time that persistence is the one strength most important to achieving your goals and one that will always, most certainly, pay off. Persistence is a quality asset too. But how do you become persistent? There’s no substitute for getting up again and again after failure. I’m the sort of person who never gives up. I think it’s because I have vision and my faith in my goals is so strong it ensures I take the next steps to achieving them, until they are finally conquered. I’ve had a number of projects on the go lately (going on and on and on) for which persistence has been the key to getting through. Pressing on, even though I often feel like quitting, isn’t easy of course, especially not with all the distractions and challenges around me. But being persistent also, usually, gets me much more than what I was after. Have the ability and flexibility to adjust and adapt. Be objective about your plans and the action steps you have in place. Always look for ways to increase your chances of achieving your goal, then change your approach accordingly. I often say to myself, ‘oh well, if those steps don’t work, I will change my strategy’. One step at a time, while staying flexible, gets the job done – tick! Persistence is about lifelong learning. You have to realise that any goal worth reaching will always take time, effort, continuously learning new skills, using new tools and plenty of thought work. So welcome change and new ideas and continue looking for ways you can incorporate these into your life. See learning and self-development as a way to reach your goals more quickly. Learning and continual growth do not end at a certain age or stage of life, they are the never-ending essence of life. Persistence is not stubbornness, it’s vision. Your persistence will provide its own motivation, eventually at some point getting you the results you want. Your goals may change from time to time and that’s okay. Or giving up is okay too, if your goals change along the way. But persistence can provide you with the strength to carry on, when things may seem tough and slow. In simple words, persistence means the attitude and personality trait of working hard and trying again and again until success is achieved. So, no matter what happens, rely upon your self-discipline and believe that everything you do will somehow count toward the right outcome in the end. Persistence is the quality of never giving up and holding on to your dreams, no matter what the odds. Develop and enjoy your persistence!